Looking good blord! Looks like a lot of stuff to fit inside that box now. Maybe you could find a box or something small to put the addon in and the mount it on top of your current lpm. This is kinda why I'm thinking the other lpm setup from arg will be better because I'm already going to have to make a new inclosure either way. Any suggesting how to wire it better ? Maybe using the 6V 4x AA block for the Arduino instead of the 9V block. What you could do is unsolder/snip the "Vin" pin going into the Arduino, hook up the red wire to the 6V from the AA's and the Arduino will run off of USB when it's connected. Probably a better option than using only one 9V as that will create unbalance in the cells which isn't good for the Ophir. Let me get that straight. The red and black wires from the addon to the 6V block and the white wire to the Ophir head. Then snip the Vin pin beneath the small board on the Arduino ? I have primary Li cells but I don't have batterycasing for it. For now I stick with the four AA cells unless the space is restrained inside the LPM. Yup, that is correct, but the black wire will also have to be connected to the ground on the Ophir. You are sure that the ground on the Ophir head is the same ground as on the 6V block for the LCD panel ? Because the 2x9V block and the 4xAA operate separately on different devices. Jerry told the Ophir is quite sensitive and I don't want to blow it up by a voltage mismatch. It shouldn't hurt to connect the grounds on the two systems, but measure the voltage before reconnecting the Ophir to be safe. I have hooked it on my existing Ophir and after installing the driver it works. 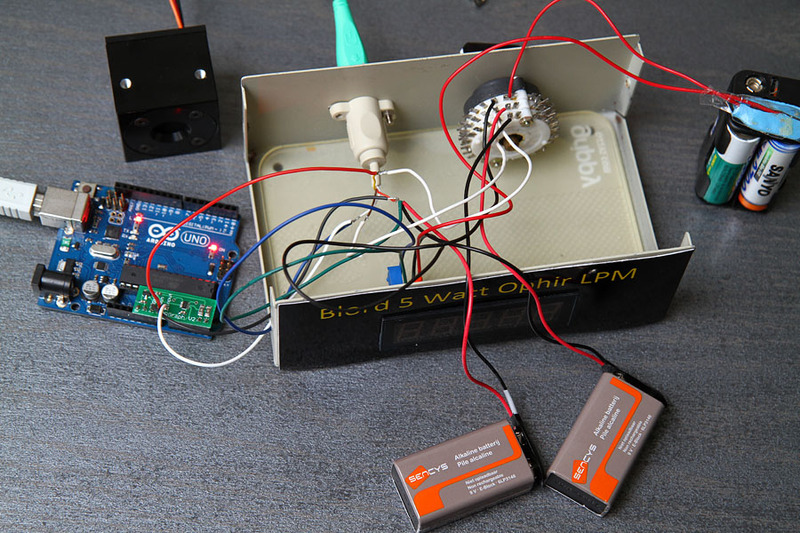 The red LED on the board lights on and starts to collect data from the sensor and sending it throught the USB cable. 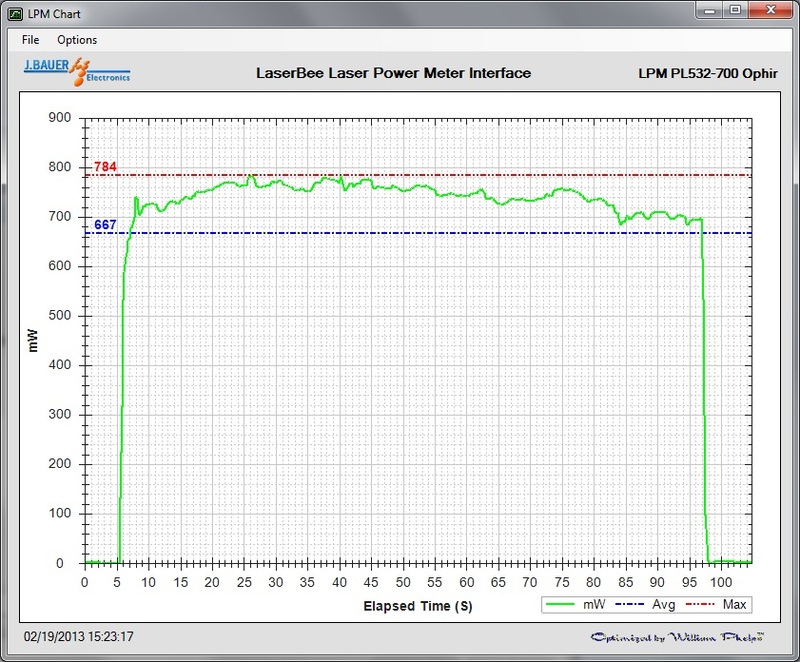 The Skylaser PL532-700 was the testlaser and here are the results. 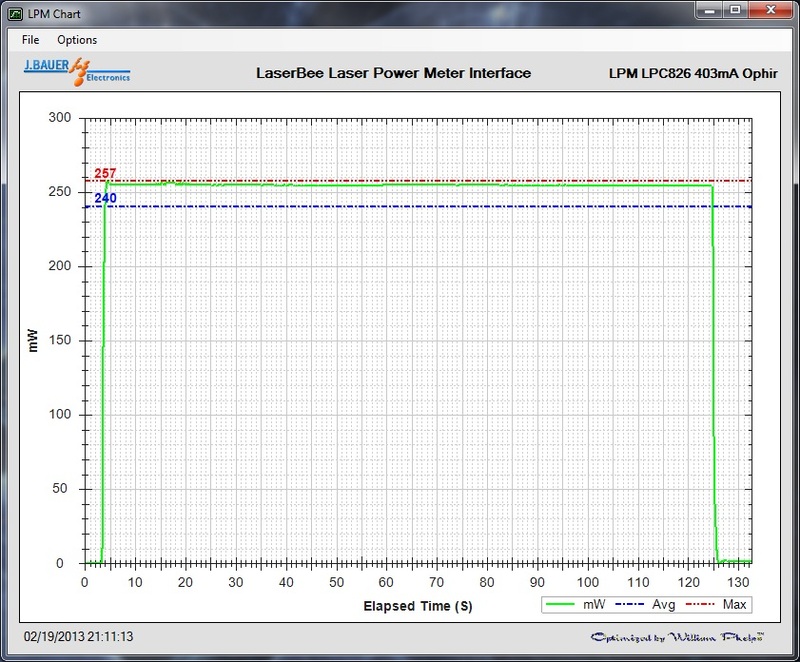 the 1st graph data shows while you were logging that Laser...?? does it seem to use any kind of shielded cable. It was a high powered green laser. Their power output tends to move around when measured on professional fast-responding thermopiles. Also, those panel voltmeters have a much lower sample rate than an Arduino. Fast response time to a reading change should not be confused with noise. Testing with a high power 445nm laser (which has a much more stable output than a high powered DPSS 532nm laser) could be used to see if there is any appreciable noise present in the system. Like Trevor said, the DPSS laser has the tendency of erratic output. I took a red laser for another test to see if it is noise. Red lasers are very stable like other diodes laser. I don't think it is noise. The sample rate is 5 per second. I don't know if it is a property of the software or the hardware. Zoomed out area of the start. The output seems to hover between 255mW and 256mW. Hey guys! I also got the ARG board in :beer: it looks good thank you buddy! But now for getting it to work i don't have laserbee interface or software. So what do need to install to get a good graph? I am a total noob with arduino's. It is noise free, even without the filtering caps it was not an issue during my testing. As Trevor said it's the response time of the Ophir that causes the graph to look like that, it shows the power instability better than a TEC LPM. 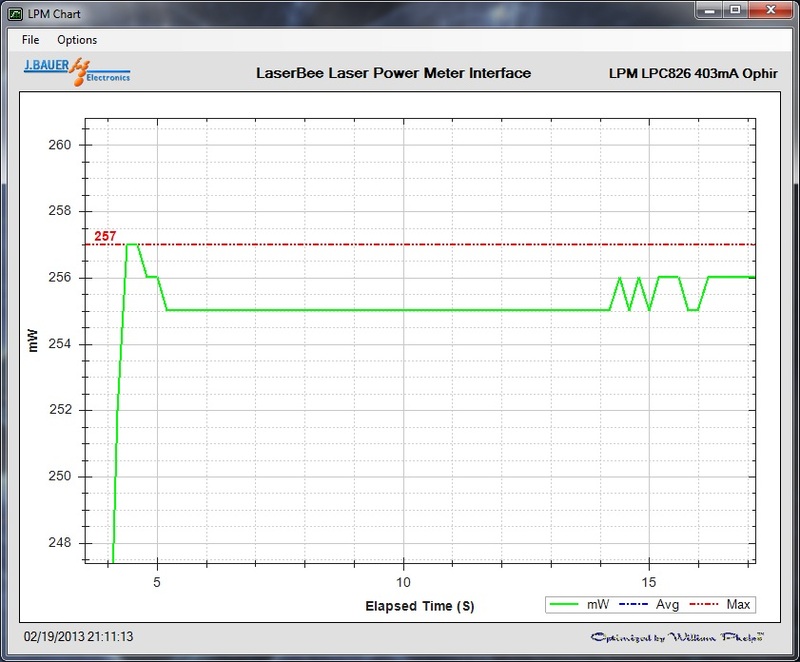 but the 532nm Laser's output. Hey guys! I also got the ARG board in it looks good thank you buddy! same issues installing your Data Logging PCB. It hasn't been released Open Source yet Jerry When it's good and ready I will release it Open Source. Even then I have no obligation to help every person set it up in public forum because this is Open Source. The only problem he had was that he re-flashed the firmware, I'm helping him set it up in PM. What's the big deal about that? I thought open source meant it will be shared when the person is done and ready to share. They make their final project open for everyone to see and share the info so a person can either build upon it or use it as is. Not necessarly as they go through it and are fixing things as they go along. Otherwise it could be a huge mess as everybody trying to put input to the project. It's not like I see them asking for anyones help and then hiding the results. It's more they are building the project and willing to share once they are done. Two different scenarios in my opinion and that's all it is, my opinion which doesn't count for much.